Choosing the right glue is crucial! It decides the amount of spin, the consistency of the rubber’s performance that many amateur players don’t care enough. While professional players glue and reglue often to maintain the high quality of speed and spin for their combinations. Many players don’t know how to glue and remove the glue correctly. Today, let’s learn which type of glue is allowed to use by ITTF, the difference between the VOC, Waterbased, speed glue and booster. How to glue rubber without bubble air. Finally, I recommend you the best glue in table tennis to buy. (There are the glues that give you the highest performance in table tennis: speed, spin, and durability). Bad glue or you don’t know how to glue, the rubber can be peeled off like this. Which type of Glue is allowed? Why table tennis players use Speed Glue? Is using Speed Glue safe? How to use Speed Glue in table tennis? Why do you need to reglue often? Here is the list of 05 types of glue used in table tennis. Only 2 types of them are allowed by ITTF, and 3 types of glues are banned. The VOC glues (VOC Definition: Volatile Organic Components) are now officially banned by ITTF in competition. It is important to distinguish glues that contain VOCs and those that do not. Since September 1, 2008, glue with VOC and treatments are prohibited. At some regional, and city level, some players still use VOC glues, and “airing” the racket few days before the competition. But if the VOC doesn’t evaporate fast, and the umpire checks your racket, you have a risk to be banned (illegal use of VOC glues). Typical VOC based glue used at the amateur level, DANGER. This adhesive does not comply with the valid rules of the ITTF. Not approved for the competition! Using VOC is the chemical treatment onto the sponge. So it is not allowed. So if you are using VOC glue, I recommend you to switch to water-based glue to avoid the problem in competition in the future. Speed glue has been banned in competition a long time ago. Speed glue contains dangerous and poisonous compounds, so contact with the glue or breathing in the vapors is a health hazard. Many scientific attempts have been applied by ITTF to detect the illegal use of glue in table tennis. I have explained the “secret” of speed glue and booster here. You may hear of “Speed Glue”. Speed glue is the glue that is used to fix the rubber to the racket. But it’s not the normal glue. Speed glue contains a lot of VOC (Volatile organic compound). It’s a mixture of 40% Cyclohexane, 50% Acetate Butyl, and 6% natural rubber. It may also have the benzene rings and N-hexane. Speed glue contains high volatile solvent vapors which make the sponge of the rubber expand. This stretches the rubber giving it a “high tension”. It’s like adding the “trampoline”, make the rubber become more bouncy. The speed of the ball will increase by about 10%. But the most important is the spin increase: up to 20%. The effect will last between 3-5 hours. Then it would wear off and the extra speed would be lost because the VOC gas has escaped away from the sponge. If you play table tennis before 2007-2008. You would remember that at tournaments hundreds of kids lining the corridors of the sports hall, “gluing up” their rackets and inhaling the fumes. The hall is full of smelly organic compounds. Everybody just wants to get the fastest racket in the world. Once you started, it was impossible to stop as if you didn’t do it your racket would feel incredibly slow. ITTF decided to ban Speed Glue in September 2007 due to health concerns. The date had been moved back to 1 September 2008. However, after an unconfirmed health incident in Japan, ITTF banned immediately using Speed Glue in 2007. ITTF is right. This is the composition of the VOC compounds in Speed Glue: cyclohexane, n-hexane, benzene, toluene. Do you know what does it mean, this pictogram? It’s is Carcinogen pictogram. Benzene (and Toluene) in the Table Tennis Speed Glue cause cancer! Don’t inhale the vapors from the Speed Glue, because it is aspiration hazard and organ toxicity. Pour the Speed Glue onto the sponge of the rubber and spread it with the brush (drying time approx. 2 hours, depending on humidity, room temperature, etc.). When the glue on the sponge of the rubber is dry (check by touching), spread another layer (2 layers of the glue). After the second layer of glue is dry, apply a layer of Speed Glue onto the blade. After 4 or 5 Minutes (when the glue is transparent), attach the rubber onto the blade. You can use hair spray to accelerate the drying period. Speed gluing effect will last at least 7 to 10 days. If preferred you can speed glue the rubber again at any time. The speed gluing effect will last at least 7 to 10 days. If preferred you can speed glue the rubber again at any time. Since VOC Glue is forbidden. Players started to use Water-based glue. It’s the only glue that is allowed by ITTF today. Read below to understand the difference between the VOC glue and the Waterbased glues. I also recommend the top 5 water-based glues which are the best for the rubber performance in table tennis. Nowadays, almost every professional players use water-based glue to glue their rubbers on the blade. Look at this photo of Timo Boll’s personal equipment. Booster and Tuner are also banned in table tennis by ITTF. However, it’s very difficult to detect the use of “booster” in table tennis. This practice (to boost and tune rubber) is common by the players who use hard Chinese rubbers. If you use Chinese rubbers on the forehand, you should read “how to tune in table tennis”. It’s illegal to tune, to boost your rubbers. It modifies not only the sponge density but also the sponge thickness. Even some manufacturers often use VOS glue to glue the topsheet to the sponge. And then they also apply the booster on the sponge, and call it as “Factory Pre-tuned version”. However, this version is allowed by ITTF. But tune, and boost the rubber at home is forbidden. It’s not easy for ITTF to detect the limit of 3ppm of compounds in the air around the blade. You can not measure the VOC and booster organic solvent in the sponge. Because the glue dries quickly but absorbs into the sponge. The organic solvent dissipates after several days, but the low VOC will stay inside the sponge. There are many table tennis boosters available on the market: Haifu, Danchi, Falco Booster, Revolution, etc. For the long duration effect, you can use Falco Long Booster (check price/ read review). Be careful when using Booster. The booster will expand the sponge and increase the sponge thickness. The maximum thickness of the rubber (sponge and topsheet) that is allowed by ITTF equipment rule is only 4 mm. Be sure to check the sponge thickness or you could be disqualified in the competition. Self-adhesive sheets are used mainly by pimple players. Because they can use pimple without the sponge, so it’s very hard to glue the pimple with normal glue. Pimple (short pips, long pips) players often use self-adhesive sheets. And they are legal! Butterfly Chack Sheet is a very strong glue. I recommend you to seal your blade before using the self-adhesive film. If not, the film can peel off the outer layer of your blade! Strong glue can damage the blade and rubber if you don’t do it carefully. For the safer choice, you can check the Nittaku Nori Plus Glue Sheet or Donic Glue Sheet. Nowadays, some rubbers brand (like Butterfly) recommend players to use only the water-based glue. And only non-VOC glues are allowed by ITTF. So you have no choice, you must use water-based glue in table tennis. Easy to use. Quickly dry off. only requires one layer on the rubbers, sticks perfectly, is very easy and smooth to remove and leaves a very little residue on both blade and rubbers. The rubber is perfectly glued on the blade. It’s the organic solvent, and it’s not water! So it won’t damage the wood layer on the blade. (Remember: Blade is made by wood, and it hates the humidity). It is easy to take off the old rubber and remove the glue off the blade, and the rubber. After complete drying, the majority of the volatile components will have evaporated. If you have the competition, please reglue at least 3 days before. But once all the VOC aired-out, there shouldn’t be a significant difference between the waterbased glue and the VOC glue in term of the rubber performance. The VOC based glue actually gives rubbers a mild form of priming, which actually boosts their performance a little bit (not as much as the booster), although not everyone finds this effect noticeable. This effect is more noticeable (and effective) on hard sponged Chinese rubbers than it is on most Euro/Japanese rubbers. You should air your racket (especially do not confine in a cover, a bag, a plastic bag) to be sure to pass the Anti-VOC control. In the end, as long as you glue your racket a couple of days ahead of time and air it out, most testing devices won’t be able to detect it. It’s allowed by the ITTF rules. It’s water. It will damage the wood (the blade) if you reglue several times. So you need to seal your blade to protect the wood. A common issue I’ve seen people have with water-based glue is caused by them stretching the rubber when applying it. They would roll it out with pressure, causing the glue halves to adhere and then be pulled from the blade or sponge. Why professional players reglue so often their rubbers? Because the glue attributes a lot in the feeling of the racket. And top players preferred a “strong impact”, therefore they need a strong glue! (recommended by Liu Guoliang). In a good hand, a player can easily say that “this rubber is well glued, or it is badly glued”. By doing some forehand topspin training, and by hearing the sound, they can confirm the “gluing problem”. Top Chinese players use very thick glue – See the glue thickness layer on the personal rubber of Ma Long, and Wang Hao. Thick glue and strong glue are always good. It ensures the high amount of “contact” between the ball and the blade. That’s why Ma Long, Wang Hao, Timo Boll, etc always use thick and strong glue. Zhang Jike has confirmed that he changed (reglued) his rubbers very often during competition. Bad glue and weak glue will greatly reduce the feeling and spin. Because at the moment of contact, the power is greatly reduced by weak contact. This is the “gluing problem” that many amateur players don’t understand. They let the glue dries for too long. And after 3-5 months, they don’t understand why the feeling and the spin have been changed dramatically. When we talk about the best glue in table tennis, that’s mean the Regular Glues, or Normal Glues (Water-based glues) which are allowed by ITTF. I don’t recommend you to use Booster, Speed Glue, or VOC Glue if you are new in table tennis. I’ve used several water-based glues (Butterfly, Nittaku, Donic, DHS, Haifu). And here are my favorite top 5 Water-based glues that you should use. They are in general strong glue, not too slow to dry, and good durability for the long term. With all water-based table tennis glues, it is very important to let the glue dry before attaching the rubber. If not, the chemical liaison is not fully finished, the adhesion is very weak (bad gluing). Butterfly Free Chack Glue (check price/ read review) is used by many professional table tennis players: Xu Xin, Timo Boll, Zhang Jike, etc. Because it is a strong glue. And it is very clean. (Easy to remove, the glue dries fast, and little residual on the blade, No funky smell, minimal mess with the clip). The product also includes 15 sponges. Applying the glue is a pleasure with Free Chack. EASY TO APPLY: Apply the glue evenly on blade and back of the rubber sheet using the clip and sponge provided. When the glue dries clear. The milky color will become transparent. You need to wait for about 5 minutes. Then you can apply the rubber to the blade. Gently press and roll the rubber on the blade. Cut excess rubber from the racket. EASY TO REMOVE: Easy to remove from sponge and racket when changing rubber sheets. Despite the Joola X-Glue (check price/ read review) is the water-based glue. It felts like former speed gluing. It’s a solvent-free glue which provides excellent adhesion of blade and rubber after short drying time. Furthermore, the rubber can be removed from the blade without any problems. 2. Wait until the glue is dry (glue will be transparent, approx. 4-5 minutes). 3. 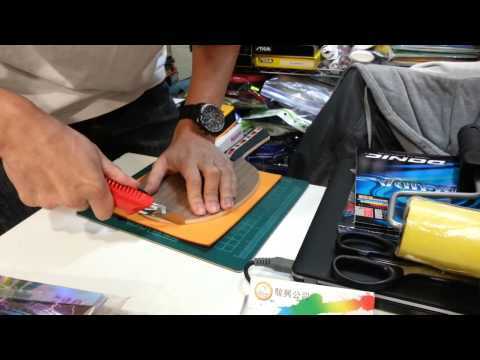 Attach rubber onto the blade. Please note: Use sponge roller only once! Change the roller/sponge for the next time. Donic Vario Clean Glue (check price/ read review) is a great water-based glue. The glue works very well. Almost every player in my club uses this glue because it’s cheaper than Butterfly glue. Please note: With the Donic Vario Clean Glue, you should wait for the glue to dry 12 to 15 minutes, or until the glue is transparent. Then you can adhere the sponge to the blade. This glue is not clumpy and easy to clean. The bottle comes with 15 applicator sponges and one clip. Apply the glue evenly on the blade and rubber sheet with the clip tool and sponge included. You should store the glue in a cool place. Free chack II (check price/ read review) is a glue for the new trend of table tennis with a harder plastic ball. Free Chack II generates a stronger bond than the Free Chack. It’s the latex-based adhesive. If you use Butterfly spring sponge rubber (like Tenergy rubber, or Spin Art) I recommend you use Free Chack and Free Chack II. This glue is easy to use. Apply the glue on the rubber and the blade. Wait for 10 minutes when this water-based glue dries and transparent (until it becomes completely CLEAR on both surfaces). The glue color changes from white to transparent. Apply the rubber to the blade. Gently press and roll the rubber on the blade. Cut excess rubber from the racket. One of the best glues for the new generation ESN and Japanese rubbers. Although it’s rather expensive. You can use Donic Vario or Joola X Glue as a cheaper alternative. While Free Chack is the best glue for ESN and Tenergy rubbers. For hard Chinese rubbers, you need a very thick and strong glue. Chinese players use this glue for years. DHS glue is amazing to glue boosted H3. Because it’s not easy to glue the domed Chinese table tennis rubbers. You need a very strong, and thick water-based glue. DHS no 15 provides excellent elasticity to glue the domed Chinese rubber. To have a very thick layer of glue, you should add several glue layers. The elasticity will increase after adding several layers. This technique is developed by the Chinese National Teams & DHS technology Center. If necessary you can use the hairdryer to accelerate the airing of glue. The similar glue is Haifu Water-Solubility Glue (check info). Chinese national players like Ma Lin, Wang Hao, Ma Long use Haifu Glue to glue their personal National Hurricane rubbers. Revolution No.3 Glue is a new generation of elastic table tennis adhesive. This glue is designed to apply 3 glue layers on the rubbers. European ESN rubbers and Japanese rubbers are different from the Chinese rubber. Click here if you want to glue tacky Chinese rubber correctly. The sponge density is smaller than the Chinese rubber and tensioned included. Tenergy rubber is always flat and is never curved. So don’t use several layers of glue on normal Japanese (Butterfly) rubbers. How many layers of glue should you use? Only one layer for ESN (Donic, Tibhar, Cornilleau, Stiga, etc) and Butterfly rubbers. And you should use at least 3-5 layers for Chinese (Hurricane, Friendship, Palio, etc) rubbers. Use the roller will help a perfect gluing. Use the sharp cutter to cut the rubber professionally. Here is the full guide to glue non-Chinese rubber of ppball. Wow. Thank you coach. Great tutorial for gluing. I will share this in my club.